ENGL makes some killer amps with loads of gain. Now IK Multimedia has added more high gain edginess to the Amplitube store. They have added the ENGL E650, Powerball, and 2 4X12 cabs. The E650 all-tube amp head is an ENGL signature model that brings an incredible range of rhythm and high-gain lead tones from a dual mode amp. It delivers a vast array of tones from sparkling clean to bone-crunching distortion, and everything in between thanks to its two switchable channels with different gain ranges, a shared EQ section and a contour button that boosts the mid-frequency range between 200 and 500k, and bright switches for boosting the upper treble range. The ENGL E650 conjures up classic rock-god tones from the 80s and 90s as well as heavy crunch and distortion for tomorrow’s tone connoisseurs. The ENGL Powerball model is based on one of the most powerful modern high-gain amplifiers. It is highly regarded for heavy rhythm tones and its many sound-sculpting options. The Powerball model has two main channels, and then each channel has two different modes. Channel I offers “Clean” and “Crunch”, and Channel II has “Low Lead” and “High Lead”. It has the power and flexibility to create everything from modern super high-gain leads to heavy crunch rhythms to ultra-clear clean tones. The new AmpliTube CS release also features two matched ENGL speaker cabinets: the E412 Standard and the E412 Pro XXL. These perfect companion cabinets are capable of rendering the complex harmonic structure, razor sharp attack and massive low end thump of the amplifiers at their best, without losing anything in the midrange frequencies. The AmpliTube Custom Shop for Mac/PC is a free DAW plug-in and standalone app that gives players access to some of the most sought-after analog and digital music gear. Once installed, it allows players to browse collections of gear models from the world’s top manufacturers of gear including Fender®, Ampeg®, Orange®, Soldano®, Seymour Duncan®, Jet City®, Gallien-Krueger® and more, plus signature gear from artists like Slash and the late Jimi Hendrix. Players can buy individual pieces of gear using Custom Shop gear credits or entire collections with gear credits or currency. With IK Multimedia’s range of interfaces for mobile devices and Mac/PC, getting guitar signal to AmpliTube is as simple as plugging into an amplifier. 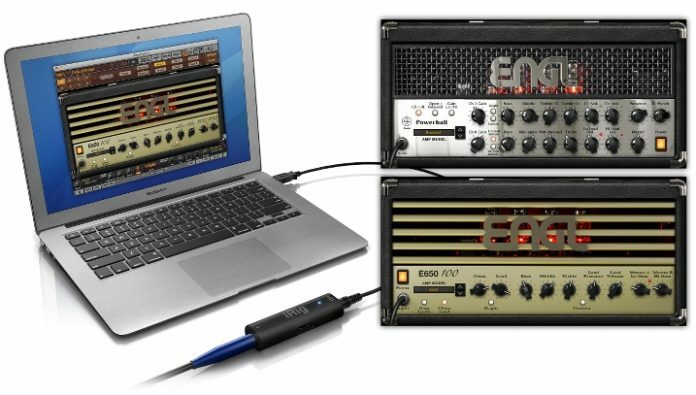 iRig HD and iRig PRO are the newest digital interfaces that allow players to plug into an iPhone, iPad, iPod touch and a Mac or PC* and delivers pristine quality pure guitar signal. *Support using the ASIO4ALL driver on Windows® XP, Vista, 7 or 8. To access the new gear models in the AmpliTube Custom Shop, users need to download AmpliTube version 3.12, which is also a free update for current AmpliTube owners, and is available for Mac/PC. The gear models in the Custom Shop are sold using Gear Credits and are priced between 5 and 30 credits each. Gear Credit Packs start as low as $19.99/€15.99 (for 20 credits) and go up to $749.99/€639.99* (for 1,500 credits).